I have been trying to clean out my pantry and get rid of the things I bought on a whim, but hardly ever use. Bisquick is one of those things. I bought a giant box of it a few years back and it's been sitting in the pantry ever since. I decided to make muffins with some leftover rotisserie chicken. I shredded the chicken and grated about 2 cups of sharp cheddar cheese. The Bisquick box didn't have directions for muffins, so I decided to wing it. I put what was left of the Bisquick in a bowl (I'd guess it was about 2 cups, maybe a little more). Most of the directions for stuff on the box called for milk, but I had some buttermilk in the ice box I needed to use up. Amount? I have no clue. 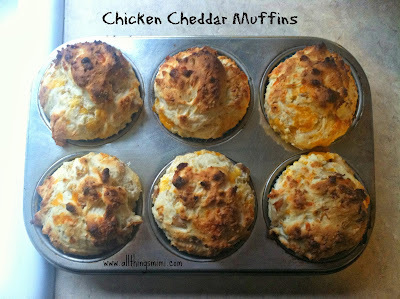 I put the dry mix and the cheddar and chicken in a large bowl and added Bisquick until it looked like a stiff muffin dough/batter. I over filled a 6 muffin tin (after adding Spongebob cupcake liners) and put it in a 450 degree oven for about 18 minutes. The resulting muffins were pretty darn good! I can't wait to try a ham and swiss version that doesn't have that weird chemical Bisquick flavor.